zsm-5 molecular sieve catalyst is synthesized directly by reacting soluble glass with aluminium sulphate to Zeolite ZSM-5 molecular sieve, not using organic amine. 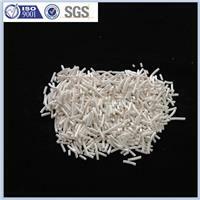 Zeolite zsm-5 molecular sieve catalyst has been used as the parent of alkylationm, isomeration, aromatization and dewaxing catalysts and so on. The zeolite ZSM-5 molecular sieve catalyst, characteristic of the simpler synthesis process, stabler quality, free of pollution, less cost, better hydrothermally, compared to those of ZSM-5 molecular sieve catalyst synthesized using organic compounds overseas, won the second place of the state inbvention prize of P.R.C. Thermal stability The differential thermal analyst(DTA) curve shows that the crystal exhibits no major structural change up to temperature of about 1200℃. Hydro-thermal stability The binder-additive catalyst could retain its crystallinity when treated under 100% steam at a temperature of 700℃ for 12h.